Israel lets nearly 200 Gazans protest Charlie Hebdo's cartoon after Paris massacre, fly Hamas banners on Temple Mount. 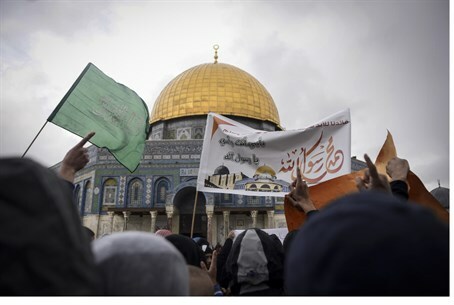 A full 185 Arab residents of Gaza were given rare permission by Israel to hold prayers last Friday on the Temple Mount, where they promptly waved banners of the Hamas terrorist organization and burned French flags, protesting satire magazine Charlie Hebdo's recent cartoon of Mohammed. The magazine's Paris headquarters were targeted in an Islamist terror attack two weeks ago, with 12 people including senior staff brutally murdered over its depictions of the founder of Islam. Defiantly the paper last week released a new edition with Mohammed on the cover, which has sold out in record time. The nearly 200 Gaza residents apparently did not take kindly to the courageous act of free speech, as Palestinian Arab Ma'an News Agency reports they burned and stomped on French flags at the Temple Mount, the holiest site in Judaism. Ma'an included pictures of the burning flags under foot, and photographic evidence from the prayer gathering shows that other flags were involved as well - namely the flag of the Hamas terrorist organization that rules Gaza, and has the genocidal destruction of the Jewish people written into its charter. Outside of the Al-Aqsa Mosque, the Muslim masses shouted "Mohammed is our prophet forever," and "with our blood, we sacrifice ourselves for you, messenger (Mohammed)," reports the Arab paper. Likewise, the participants waved banners bearing the Shahada, the Islamic declaration of faith: "there is no God but God and Mohammed is his messenger." The permission granted to the Muslims from Gaza to visit and wave Hamas flags may strike many as ironic, given that Hamas launched a war against Israel last summer, its third such attempt to militarily erase the Jewish state. By contrast, Jews have been forbidden by the Jordanian Waqf (Islamic trust) from praying at the holy site, and are even forbidden from bringing Jewish symbols with them to the Temple Mount - those symbols have at times even included grape juice. And yet the flags of the terrorist organization Hamas were allowed on the site, which has remained under the de facto control of the Jordanian Waqf since the 1967 Six Day War, when the holy site was liberated by Israel. The most recent visit comes after last October 5 - under two months after the last war with Hamas ended - Israel let 500 Gazans pray at the Temple Mount. Reportedly it was the first time Gazans were allowed on the site since 2007, when Hamas violently took power in Gaza after winning elections. The 500 Gazan residents were allowed in for Eid al-Adha, a Muslim holiday celebrating the "sacrifice of Ishmael" by Abraham in an appropriation of the original Torah story. The visit also took place a day after the Jewish high holiday of Yom Kippur, which fell on October 4 last year.